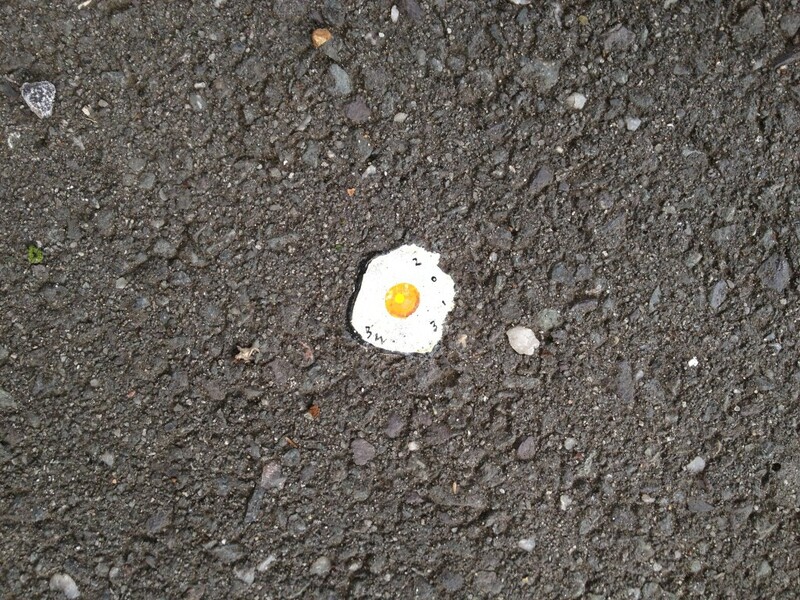 This is a bit of chewing gum painted to look like a fried egg. I love the whimsy of it, and the artist, Ben Wilson has come to be known as the chewing gum man by some because of his work. According to Wikipedia, Wilson has “a strong distaste for industrial waste, cars and rubbish.” So as part of how he uses his voice, he turns bits of discarded chewing gum into works of art. He takes requests from people, and he does them for free. There’s a whole string of these near where I live (a couple of fried eggs, some landscapes, some fun figures). If I’m walking near this area, and I happen to be looking down instead of all around me, I’ll catch a glimpse at one of these, and there’s an instant smile. A bit of whimsy, a recreation of rubbish into art, and Ben Wilson creates smiles. When something (a situation, some product or project, anything) looks to you like utter rubbish, maybe just think of this image and then look at it again. If it’s time to let it go, then let it go, absolutely. But if there’s something in your gut telling you it’s not done yet… How can you take that rubbish and make it into art?